HOUSTON -- Allegations that former President George H.W. Bush inappropriately touched six women involve potential crimes punishable by fines or jail time, if they had been prosecuted. 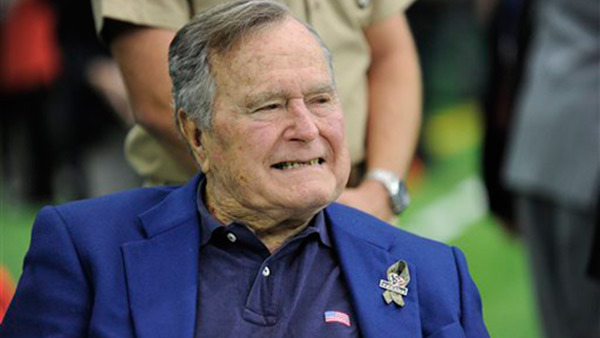 All but one of the cases is ineligible under state laws that limit when a prosecution can begin after an alleged crime, and several lawyers interviewed said that it would be difficult to win a conviction against Bush, who has vascular parkinsonism, a rare syndrome that mimics Parkinson's disease. "You're still going to be facing prosecuting a 93-year-old man in a wheelchair that's a former president," said Toby Shook, a lawyer who previously served as a prosecutor in Dallas. "I doubt if you could ever find a jury that would ever want to convict him." There's no indication prosecutors are planning to pursue a case against Bush. Jordana Grolnick, an actress who alleged that Bush groped her behind last year as his wife, Barbara, stood nearby, told The Associated Press that she has no plans to report the 41st president to authorities. That appears to be the only incident that hasn't reached the local statute of limitations on how long a crime can be prosecuted after it occurs. The six incidents occurred in three states over a decade. In all of the cases, the women say Bush touched their buttocks as they stood next to him to take photos. All three states have laws against touching someone without their consent. The women's stories broadly follow the same outline: Bush patted them below the waist as they stood next to him to take photos, sometimes with a joke about his favorite magician or writer being named "David Cop-a-Feel." Bush has issued repeated apologies through a spokesman "to anyone he has offended." The spokesman, Jim McGrath, said in a statement last month that Bush has used a wheelchair for roughly five years, and that "his arm falls on the lower waist of people with whom he takes pictures." In a statement Monday, McGrath said, "George Bush simply does not have it in his heart to knowingly cause anyone distress, and he again apologizes to anyone he offended during a photo op." McGrath did not respond to a request for additional comment Tuesday. Actress Heather Lind was the first to accuse Bush of groping her, saying in an Oct. 24 Instagram post that Bush "touched me from behind" and told "a dirty joke" while they posed for a photo at a Houston screening of the AMC television series "Turn." Five more women have come forward since then, including Roslyn Corrigan, who told Time magazine Monday that Bush groped her as they took a photo in 2003, when Corrigan was 16, during an event in The Woodlands, a Houston suburb. The AP generally does not identify victims of sexual assault without their consent, but is using the names of women who have spoken publicly on social media or in news reports. Three of the incidents are reported to have occurred in Texas. Shook said that under Texas law, touching someone's buttocks over the person's clothing would most likely be grounds for a misdemeanor assault charge, with only a $500 fine and no jail time. In Maine, where Bush is accused of grabbing two women, those allegations could give rise to a charge of assault or unlawful sexual touching, punishable by up to a year in jail, said Walt McKee, a defense attorney in Augusta, Maine. And in Pennsylvania, where a retired newspaper journalist has accused Bush of touching her during an event in Erie, the state's law against indecent assault could apply, said Richard Settgast, an adjunct law professor at Penn State University. A key question in any prosecution, the lawyers said, would be whether the suspect touched the victim for sexual gratification or by accident. While age and physical disability would factor into any determination, Settgast said, "I don't necessarily think that just because someone's infirm, they wouldn't be able to be held accountable." Bush, who served as president from 1989 to 1993, is a beloved figure in both Texas and Maine, the two states where he lives. Two days after the first woman accused Bush of misconduct, Houston Mayor Sylvester Turner tweeted that Bush was "a statesman and role model to me." Days later, Bush joined his son, former President George W. Bush, on the field before Game 5 of baseball's World Series to throw out the ceremonial first pitch.